Announcing The Launch of the New G4 Website! The G4 Kegs team is thrilled to unveil the brand new G4Kegs.com! 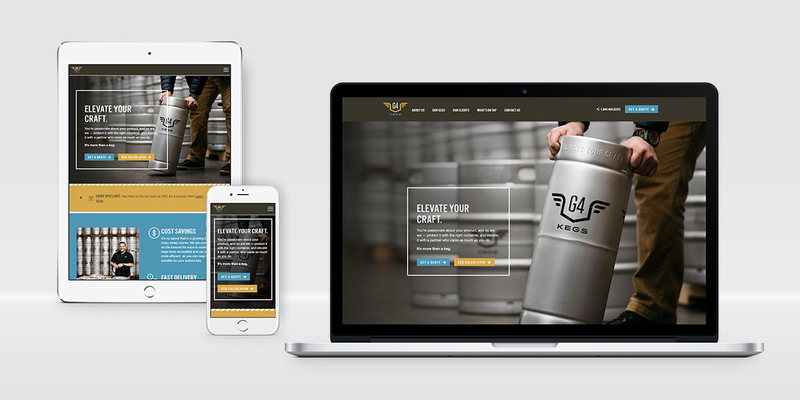 Our mission and values are the driving force behind this change, and — as with everything we do at G4 Kegs — we’ve designed our new website with you in mind. Feel free to start browsing right away, or keep reading below for a high-level glimpse at what the new website has to offer. Most importantly, enjoy this robust resource! We created it to provide more value to you! The first thing you’ll notice is our commitment to the new G4 Kegs brand throughout the website. We’ve weaved our mission and values throughout our content to show how they are the foundational drivers of our company and everything we do. Hear more about this commitment on our “About Us” page — and meet your trusted team of keg consultants (including our favorite draft beverages!). You can learn more about our quality keg products and services in the “Our Kegs” section of the site — complete with a product gallery, photos, specs, and all the information our clients need at a glance. We’ve also introduced a brand new section to the website — where we’ll be keeping you up-to-date on all things G4. Looking for a great deal? Check our offers. Interested in connecting? Take a look at what events are on our radar. Want to dig deeper? Head over to “Insights.” Also, be sure to sign up for our newsletter to get these updates straight to your inbox. We’ve also made it easier to get in touch! Submit a quote request for any of your keg or service needs — or if you just have a general question, visit our Contact page. We invite you to visit us at G4Kegs.com to explore the information and resources we have to offer, and to experience the new look and feel of our brand for yourself. We’re very excited to share this evolution with you. Our entire team appreciates your support, and we look forward to your continued partnership. Sign up for our newsletter and stay up to date on G4!